some 39km WNW of the Canada Tungsten mine. The prospect comprises 5,393 ha (53.93 km2) consisting of a system of branching swarms of dykes that extend over 13km exposed strike length and up to 500m width. Individual dykes within these swarms`are mostly 1-10m thickness. Natural exposure and drilling has demonstrated a vertical extent of 300m. Minerals of interest are spodumene, lithium micas, tantalite-columbite and cassiterite. Grades of up to 2% Li2O and 500g/t Ta2O5 are reported for individual dykes. The property has been explored sporadically since 1979. This work included soil and stream sediment geochemistry, chip and channel sampling of cliff faces and 1,798m of diamond drilling. With the current increase in the demand of Li and Ta the property has become a significant prospect. Equitorial Exploration Corp. optioned the claims in 2016 and commenced exploration with a carefully executed channel sampling programme that was performed by Archer Cathro and Associates (1981) Limited (Archer Cathro). To date no estimate of reserves that would be NI 43-101 compliant has been made. Future work would be best aimed at developing adequate grade data. The 2016 channel sampling is adequate for inclusion in a database of dimensions and grade. Further sampling using accurate surveying and documentation is needed. The property is large enough that many diamond or percussion drill holes will be required to build up a compliant resource. These may best be sited according to results of surface channel sampling. Testing of the mineralization at depth is also an obvious target. The dykes are separated by sedimentary wallrocks including quartz sandstone, limestone and shale, which do not contain significant amounts of any elements of interest. Weighted average grade calculations for channel sampled intervals are reported in the following paragraphs. Wallrock separating individual dykes within dyke swarms was sampled in Cirque 4, and the values reported were uniformly low. When calculating weighted average grades for the dyke swarms, the wallrocks were assigned zero values for all elements. Weighted averages reported for dyke material within the dyke swarms omitted wallrock dilution. north side of Cirque 4. The weighted average grade across this interval was 0.29% Li2O, 14.4 g/t Ta2O5 and 0.01% SnO2 over 16.80 m, including a total of 4.4 m of dyke material that graded 1.12% Li2O, 55.0 g/t Ta2O5 and 0.05% SnO2. Two individual dykes located 13 m and 27 m north east of the dyke swarm were also sampled, and they returned 0.87% Li2O, 56.4 g/t Ta2O5and 0.03% SnO2 across 1.90 m and 1.57% Li2O, 250.3 g/t Ta2O5 and 0.95% SnO2 across 1.70 m, respectively. A 35.80 m interval was channel sampled across part of the Berlin Wall on the north side of Cirque 4. This interval yielded 0.29% Li2O, 12.3 g/t Ta2O5 and 0.01% SnO2 across 35.80 m, with dykes within it averaging 1.50% Li2O, 63.9 g/t Ta2O5 and 0.05% SnO2 across a total of 6.90m. The best individual dyke within the dyke swarm returned 2.04% Li2O, 57.8 g/t Ta2O5 and 0.05% SnO2 over 4.00 m.
On the south side of Cirque 3, a portions of the Berlin Wall swarm returned 1.00% Li2O, 21.3 g/t Ta2O5 and 0.01% SnO2 across 4.45 m, including 1.95 m of dyke material that graded 2.29% Li2O, 48.7 g/t Ta2O5and 0.01% SnO2. thickness of the dykes graded 1.21% Li2O, 65.4 g/t Ta2O5 and 0.03% SnO2. averaged 0.50% Li2O, 21.3 g/t Ta2O5 and 0.01% SnO2 over 19.70 m, including four dykes totaling 7.00 m that graded 1.41% Li2O, 59.9 g/t Ta2O5 and 0.04% SnO2. An individual dyke located 77 m east of the Great Wall of China dyke swarm on the south side of Cirque 3 returned 1.63% Li2O, 52.9 g/t Ta2O5 and 0.01% SnO2 over 5.15 m.
A 10.35 m wide portion of Hadrian’s Wall was sampled on the south side of Cirque 3. This interval returned 1.13% Li2O, 71.1 g/t Ta2O5 and 0.03% SnO2 over 10.35 m. Within that interval, dyke material graded 1.86% Li2O, 116.7 g/t Ta2O5and 0.05% SnO2 across 6.30 m.
type pegmatite dykes that crop out over a strike length of 13km in seven separate groups within the present property boundary. Spodumene and to a lesser extent the micas are potential lithium sources. Accessory tantalite-columbite and cassiterite contents have sufficient grades to bring the rock to within potentially economic values. Continuity of the dykes over a vertical range of 300+ metres is demonstrated by natural exposure and past drilling. So far the greatest thickness of a single dyke encountered is ≈10m, encountered in drill holes 6 and 7. The thickness of each`swarm`of dykes is up to 300m. The most reliable channel sampling has been that performed in 2016. Careful measurement of dyke width and host rock intervals have enabled bulk grades tobe calculated. Such results as 10.35m at 1.13% Li2O, 71.1 g/t Ta2O5 and 0.03% SnO2 are highly encouraging. The pegmatite system has not been investigated to depth. The potential exists for dykes to coalesce below the level of the lowest cirque and grade could well be different. Closer to the postulated buried intrusive source for the pegmatite beryl could become significant. There is also the possibility that greisen has been developed in the upper portion of the granite, with potential for Sn and W. Drilling of several deep holes along the extent of the system is desirable. The Tule Valley Project consists of 26 claims of 26 acres each and is located approximately 190 south westof Salt Lake City, Utah. The property straddles Juab and Millard counties. Access is by a all weather, hard surface highway from Delta, Utah and from Wendover, Nevada or by a paved road to the south. Further access is by gravel roads in fair condition. The terrain is readily amenable to the construction of the necessary infrastructure related to mining operations. This includes, but is not limited to, potential tailings storage sites, potential waste disposal areas, heap leach pad areas and potential processing plant sites It would be necessary to access electrical power from Gold Hill or Callao (Lee, 2003). Surrounding area is sparsely populated, with ranching and livestock being the primary economic activities. The Tule property is located 20 km south of Redhill Resources Honey Comb-Beryllium-Rubidium, Lithium and REE project. It is approximately 60km to the northwest of the Crystal Peak potash, lithium and magnesium project and 30 Km to the south west of Matererion’s Spor Mountain Beryllium Mine. The basins in this area are defined as arid, generally receiving less than 8” of precipitation per year. Evaporation exceeds precipitation with hot dry summers and cold dry winters. Tule valley is an endorheic basin, which means that it retains water but does not allow any external outflow. This means that any element that mobilizes into the basin, can enter but never leaves. This poses the hypothesis that over millions of years the aquifer may have upgraded into an extremely mineralized brine. Similar to that of Clayton Valley, Tule Valley is a closed basin and has a horst and graben structure. The valley is down faulted by normal faults on both sides of the valley. This is a key characteristic for confining brines so mineralization cannot escape. The area to the north contains volcanic rocks such as rhyolite flows and tuffs ranging in age from 3.4-4.7 Ma and are known to contain significant values of lithium, beryllium, rubidium and REE’s. Chemical and mineralogical studies of samples from shallow excavations and drill holes revealed abnormal quantities of cesium, rubidium and lithium in the beryllium-bearing tuffs. (Stonehouse, 1985). Results from the soil grid suggest that lithium (Li), beryllium (Be), rubidium (Rb) and TREO (total rare earth oxides), including lanthanum to lutetium plus yttrium) mineralization may be present under shallow cover to the east flank of the Big Honey Comb Hill. Honeycomb Hills are two domelike bodies of rhyolite with a total volume of 0.5 km3, contained within an area approximately 1.5 km in diameter. Basaltic lava flows surround the area (Hogg, 1972), and tuffs adjacent to the rhyolite contain high concentrations of Cs, Rb, Li, Be, and F (McAnulty and Levinson, 1964). Illustrates stratigraphy to the north of Tule Valley. Tuffs and Rhyolites are host to the Lithium. magnetite and associated heavy minerals, including rare earth-bearing minerals, became feed for the beaches. This erosional debris was distributed, worked and re-worked as the shorelines advanced and receded. In 2009, the underlying vendors have completed detailed geological mapping, prospecting and collected 146 total samples (including blanks) with significant values of beryllium returned, along with anomalous values of lithium and uranium. Initial surface sampling (146 samples) have reported assays of up to 1,043 ppm total rare earth oxides (TREO), 1,690 ppm lithium (Li), average of 1,010 ppm beryllium (Be) and 1,270 ppm rubidium (Rb). Detailed mapping has shown an anomalous area of roughly 500 by 1,000 m with another neighboring anomalous area of 500 by 500 m. In addition, both anomalies are flanked by quaternary alluvium and could extend substantially under shallow cover. In addition, sampling and mapping of a decline excavated in rhyolite breccias show highly anomalous Li, Rband weakly anomalous TREO assays from 460-1050 ppm, 471-1035 ppm, and 392-461 ppm respectively. A total of four water samples and 13 soil samples were collected from the property. The soils were crushed, pulverized and assayed for lithium and a suite of pathfinder elements (for example, potassium, magnesium, barium, sodium, calcium, lithium-potassium and lithium-magnesium ratios). Most soil samples were collected at the claim post sites that were located on exposed playa. Samples of actively evaporating briny surface muds are all anomalous in lithium (over 0.01 per cent lithium). Each of these anomalous samples is very wet, saturated with salty brine, contains salt and/or gypsum crystals, and lies below 1,340 metres altitude. These locations are where the playa surface dips below the current groundwater table (less than 1,339 metres), wherein near-surface brines reach the surface, form shallow pools (less than 0.3 metre deep), and evaporate. The western half of the playa seems to lie at a lower altitude than the eastern half. The fact that both the surface brines (W03 and W04) and resultant saturated muds are anomalous in lithium is deemed encouraging for the deposition of near-surface lithium mineralization on the property. The Gerlach project is comprised of 89 claims, 720 hectares (1,780 acres), located in the San Emidio desert, 5 miles from Gerlach, Wahoe County, Nevada and 120 km north of Tesla Gigafactory #1. The property is located within the southern lobe of the Black Rock Desert, a graben feature of the Basin and Range geological province which is dominant throughout Nevada. San Emidio Desert is the name given to the playa extending south from Gerlach and it is the southern “tongue” of the largest dry lake bed in North America (Black Rock Desert). San Emidio is a dry lake bed (playa), its edges are covered with a thin veneer (up to 3 m) of wind-blown sand dunes and mounds. In this respect, San Emidio is not a pure evaporite basin, such as Great Salt Lake, Sevier Lake, or the Bolivian and Chilean salars, where active evaporation and salt/phosphate-deposition (±Li) is on-going. Although composed of dried mud/silt/ash, the compacted playa mud is salty (indicating some form of evaporation during the life of the playa). In this respect, the San Emidio playa may be more appropriately compared to the Clayton Valley. Country rock along the eastern margin of the playa has been hydrothermally altered (e.g. Empire Gypsum deposit, Wind Mountain epithermal Au/Ag deposit), suggesting high heat flow and intense groundwater flow. This activity would have leached lithium where present. All well-known natural hot springs in the region occur to the north and northeast of the town of Gerlach. These springs are located adjacent to the Black Rock Desert, and may feed its groundwaters, and those of the San Emidio basin. More important for Umbral’s property is the presence of US Geothermals’ electro-generation plant located 27 km south of the G01-89 claims on the eastern edge of the southern lobe of the San Emidio playa. This confirms the presence of geothermal activity (hence brines) in the San Emidio playa, which appears to be a closed valley, may have lithium-bearing clays and/or ash in its sediments, has active, hot, lithium bearing groundwater flow along its eastern margin (US Geothermal, gypsum mine, etc), and has been affected by evaporite-style processes. The San Emidio property may therefore be conducive to the presence of lithium-bearing groundwater. Gerlach exploration is expected to focus initially on geophysical surveying,particularly IP, to detect conductive layers beneath the playa floor. Brines are salty, and are therefore strongly conductive. The thicker and strongest conductive zones can subsequently be drill-tested for lithium content. Further research into the distribution of active hydrothermal activity along its eastern edge is also required. 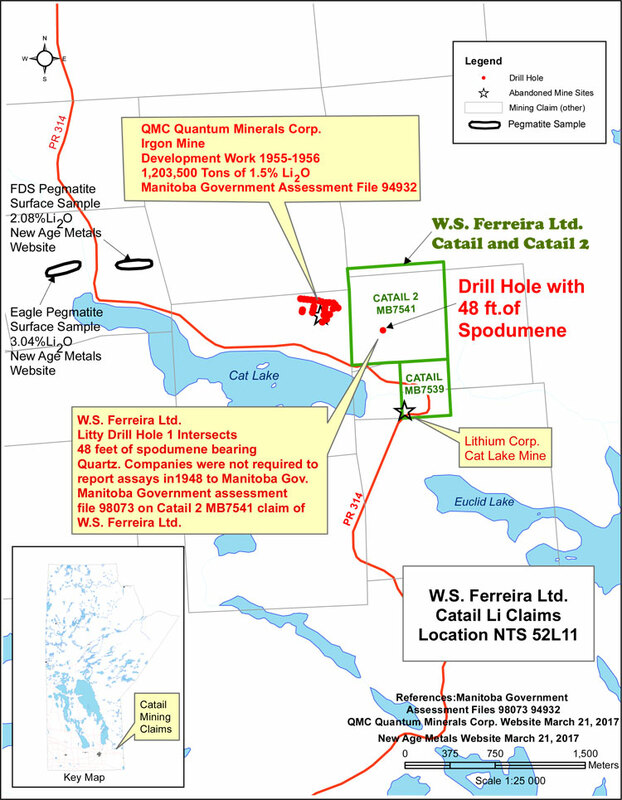 The property lies within the east-trending Mayville-Cat-Euclid Greenstone Belt (“MCEGB”) located along the northern contact of the Maskwa Lake Batholith. This northern greenstone belt has a similar structural geological setting as the Bird River Greenstone Belt (“BRGB”) which is located along the southern contact of the same batholith, and is parallel to and approximately 18km to the south of the MCEGB. The property is located 20km north of the Tanco Mine Property. The BRGB hosts the world-class Tanco rare element-bearing pegmatite dike as well as numerous other lithium bearing pegmatites. The Tanco Mine went into production in 1969 and produced tantalum, cesium and spodumene (lithium). It was previously North America’s largest and sole producer of spodumene (Li), tantalite (Ta) and pollucite (Cs). Equitorial (EXX) is investing C$1.5 million into Mag One Products Inc. (MDD) in return for 1,666,667 MDD shares including one full warrant exercisable at C$1.10 within one year. EXX has a first right to a 50/50 joint venture to finance equally the construction of the first magnesium and refining production facility for use by MDD to produce magnesium metal and related products, by using its proprietary magnesium metal technology upon EXX completing its investment of C$1.5 million to MDD. Upon the successful completion of the first production and refining facility under the joint venture terms, EXX shall then have the first right to enter into a further 50/50 joint venture in regard to participate to financing of the construction of the second production and refining facility on the same terms as the first joint venture. EXX will also have the right to finance other production facilities on a 50/50 joint venture, on a non-exclusive basis, with MDD once the first two facilities are financed and in operation.